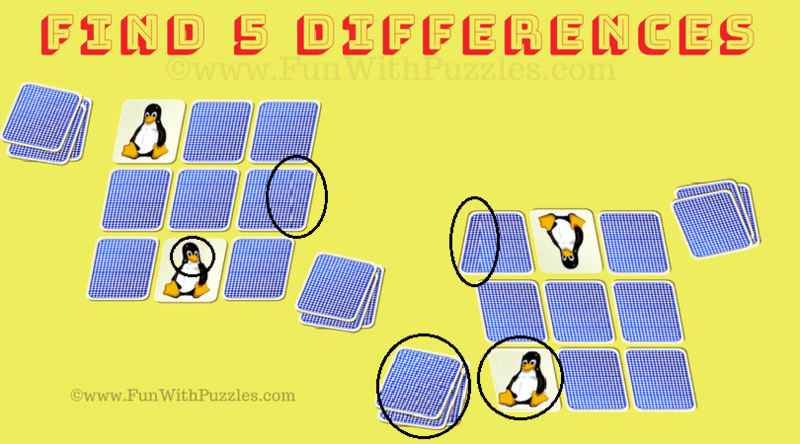 Here is one more Find 5 Differences Picture Puzzle which cannot be solved by merge pictures difference solving technique. In this Find Differences puzzle, there is two similar looking pictures of the Matching Memory Cards game. There are 5 differences in these two pictures. Lets see how much differences you can find in these pictures without looking at the answer image? Can you find 5 differences in these two pictures? Answer of this "Find 5 Differences Picture Puzzle", can be viewed by clicking on button. Please do give your best try before looking at the answer. 1. Can you find Hidden Letters and Numbers? : These are the picture puzzles to test your visual and observational skills. In these picture puzzles your challenge is to find the hidden letters or numbers. 2. Mathematics Picture Puzzles Riddles for Teens with answers: These are easy Maths equation puzzles in which your task is the find the value of the variables in equations which are represented by pictures and then solve the last equation. 3. Moving Pictures Optical Illusions to trick your brain: It contains very interesting optical illusions in which stationary pictures will be seen as moving by our brain. 4. Find the Mysterious Creature in Video Puzzle: At last there is video puzzle which will show you some mysterious creature and your challenge is to identify this creature.